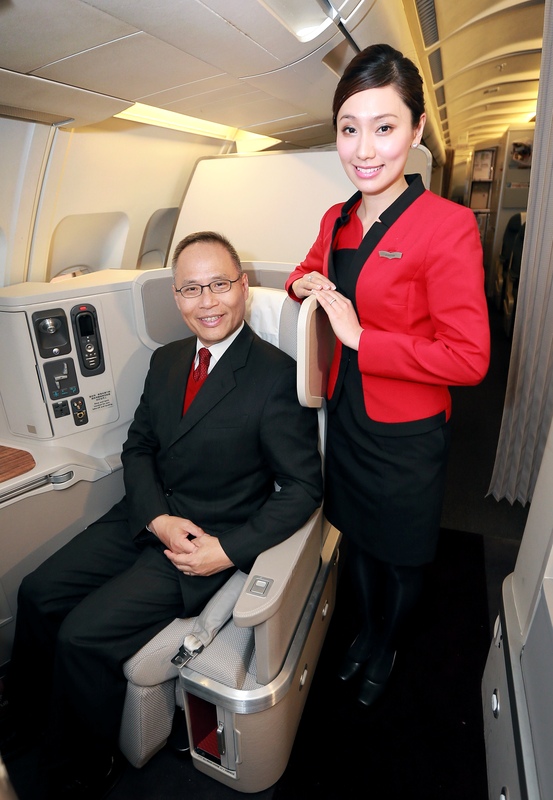 Sister Airline to the award winning Cathay Pacific; Dragonair, the regional / medium-haul carrier has just announced its cabin offerings to lift the airline’s level of luxury. The most recent announcement is the launch of their First Class offering. If the seat looks familiar, that is because it is identical to Cathay Pacific’s new long-haul business class seat which we reviewed recently. Dragonair has developed its new First Class product for its three-class Airbus A330-300 aircraft. The product will be due to enter service in the late first quarter of 2014. This will sit alongside the airline’s new business class and economy class products. As passengers enter the cabin, they immediately appreciate the sense of space and openness. Clean, sculpted lines define private seats with direct aisle access. Warm-tone natural leather is used on most interior surfaces of the seat for a luxurious feel and soft touch. Abstract patterns, richly woven fabrics and original artwork harmonise to create a warm, premium residential feel. The instant a passenger steps into their private area, they notice the generous space available in the Side Storage, which is sufficient for handbags or laptop cases. A Side Cabinet and a Shoe Locker provide storage for small valuables and personal belongings. A Vanity Mirror is concealed under a flap inside the Side Cabinet door. During the flight the Side Cabinet can be fixed in the open position to double as a privacy screen. Settling into the contemporary wing-back chair, passengers are cocooned in their own private area which has been sculpted to maximise living space. Individual privacy is assured without compromising freedom of movement. The outboard seats are gently angled towards the windows, giving passengers a perfect view. The centre seats are gently angled towards each other, making them perfect for those travelling with a companion. When a passenger is reclined into the seat with the screen deployed, privacy is assured. However at the touch of a button the seat slides forward, allowing passengers to interact with their travel companions over a central Cocktail Table. As for entertainment, Dragonair’s entertainment is now upgraded to an Audio Video on Demand (AVOD) system to allow passengers to select their own choice of movies and music during the flight. Each seat is equipped with a universal Power Supply outlet to keep electronic devices fully charged. A Multi-port Connector includes an RCA port, an iPhone/iPod connector and a USB port. The RCA and the iPhone/iPod connector allow passengers to connect their own devices and watch video through the Personal TV. The USB port can be used to charge devices such as mobile phones and tablet devices.